Set up a triangle with cones. 2 players are attackers, 2 are defenders. Attacker starts on the top of the triangle and the other starts on one of the bottom corners. They are defended by 2 defenders the whole time. 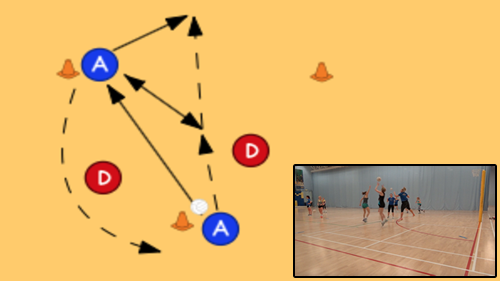 The person at the top of the triangle starts with the ball, passes to the other attacker and runs into the triangle to receive the ball back. Again they pass to the other attacker and cross the bottom line of the triangle to be outside of the triangle. They receive the ball back again and the other attacker runs to take their space at the top of the triangle. The attacker behind the line passes the ball to the new top attacker, takes one of the bottom corner spaces and the drill repeats. The attacker in the middle should look to cut off one defender before taking on the other one, 1 vs 1. Defenders need to work together to cover the passes. Defensive choices, push attacker into other defender. Or push her away to go one on one. Decide whether both will go tight or one will overrun to force the attacker back in to the centre. They need to communicate and direct each other. If the attacker is just running back to get the lifted pass every time then the coach can restrict the area to force them work on getting free in a small space.